Armagh saw off Fermanagh 0-16 to 0-11 to win the Football League Division Three final at Croke Park. Fermanagh made the better start but Armagh led 0-8 to 0-6 at half-time despite having Finian Moriarty sent-off in the 26th minute. Four unanswered points saw the Orchard County extend their lead, before the Ernemen battled back to trail by three. Stephen Harold (2) and Kevin Dyas scored late points to extend Armagh's winning margin to five. Jamie Clarke was named man of the match. Pete McGrath's side were quickly out of the blocks as Tomas Corrigan's superb initial point from play was quickly added to by two Sean Quigley frees. The margin remained three at the 13-minute mark after a Tony Kernan free was quickly cancelled out by a Ruairi Corrigan effort from play. However, Armagh regrouped to level by the 22nd minute helped by a couple of poor kick-outs from Fermanagh custodian Thomas Treacy. The levelling score should have been a goal as Aidan Forker blazed over after a superb defence-splitting pass from Miceal McKenna. Armagh looked to have suffered a major blow in the 26th minute as centre half-back Moriarty received his marching orders after receiving a yellow card, black card and red card in the same incident as he hauled down the speedy Ruairi Corrigan. But despite being a man down, Armagh bossed the remainder of the first half as three Tony Kernan frees helped them move into a 0-8 to 0-6 lead by the break. Armagh's interval lead could have been even bigger with Erne keeper Treacy making a great full-length diving save to turn a point-blank Dyas shot out for a 45. Ciaran McKeever entered the fray for Armagh in the second half and points from Kernan and Ethan Rafferty (2) saw them assume control. 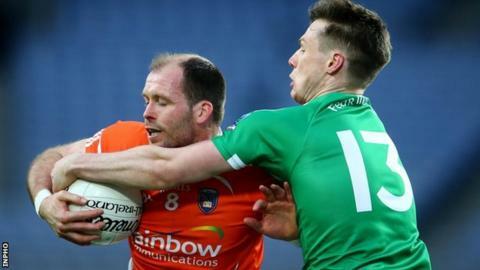 Armagh had a goal disallowed as the ball was illegally taken out of the Fermanagh goalkeeper's hands, while for Fermanagh, Quigley was instrumental in reviving his side's hopes with a series of points, before Armagh rallied. Armagh: N Geoghegan; A Mallon, C Vernon, M Murray; J Morgan, F Moriarty, M Shields; C McKeever, A Findon; T Kernan, M McKenna, A Forker; E Rafferty, A Murnin, J Clarke. Fermanagh: T Treacy; M Jones, T Daly, M O'Brien; B Mulrone, R McCluskey, N Cassidy; R Jones, R O'Callaghan, P McCusker, R Corrigan, D McCusker; T Corrigan, S Quigley, C Flaherty.